Panzica Construction Company has partnered with Perspectus Architecture and Centers for Dialysis Care over the past few years to construct several new CDCs. The newest 10,462-square-foot facility, in Cleveland’s Eliza Bryant Village, held its ribbon cutting ceremony on April 29, 2015. 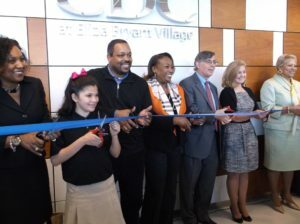 Eliza Bryant is the oldest operating African American long-term care facility in the country and all 149 residents welcomed the incorporation of the CDC into its campus.